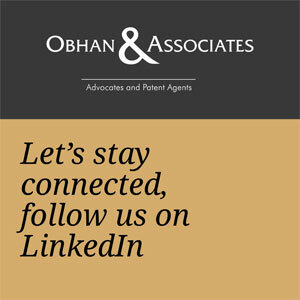 The website www.obhanandassociates.com (“Website“) is owned by Obhan & Associates (“O&A” or the “Firm“) and is for general informational purposes only. By accessing any content in this Website, the end user (referred to herein as “you“, “your“, or the “User“) acknowledges that the information provided does not amount to advertising or solicitation and is meant only for your understanding about the activities of O&A. All content in this Website has been checked for accuracy. However O&A does not accept any responsibility for any loss or damage which may arise from accessing or reliance on information published on this Website. Further, views/ opinions/ articles/ information/ discussion and other such content provided in this Website, whether by O&A or third parties, do not constitute legal advice or opinion. The views expressed in the discussions, featured articles and other such content in this Website represents the personal view of the author(s) and do not, in any manner, constitute the views of O&A. O&A reserves the right to delete, modify, or supplement the content of the Website at any time for any reason without prior notification, and will use reasonable efforts to include up-to-date and accurate information on the Website. You shall not directly or indirectly copy or reproduce all or any part of the Website, whether electronically, mechanically or otherwise, in any form including, but not limited to, the copying of presentation, style or organization, uploading, posting, or transmitting any content which constitutes the intellectual property of another party, for which you do not have a right to make available; uploading, posting, or transmitting any material that contains software viruses or any other computer code, files or programs designed to interrupt, destroy or limit the functionality of any computer software or hardware or telecommunications equipment. Unless otherwise stated, all intellectual property rights, including copyright, trademarks, patents in this Website and its contents including news articles, featured articles and discussions (“Content“) are owned, licensed to or otherwise used by O&A as permitted under applicable law. The information provided on this Website is provided solely for private use and not for any commercial or public use. You may download or print hard copies of any part of the content on this Website for your personal use. Except where your use is expressly permitted above or by copyright law, you may not otherwise copy, store in any medium (including any other web site), distribute, transmit, re-transmit, broadcast, modify or show in public any part of this Website without the prior written permission of O&A. When you use the Website or send an email or other data, information or communication to O&A, you agree and understand that you are communicating with O&A through electronic records and you consent to receive communications via electronic records from O&A periodically and as and when required. O&A will communicate with you by email or by notifications on the Website which will be deemed adequate service of notice/ electronic record. The Website may contain links to other third party internet sites providers. The availability of such third party sites, services or material does not constitute any form of recommendation, advice, endorsement or publication of any such third party sites, services or material and O&A is not responsible for their availability or content. The Website is not liable for failure to perform any of its obligations if such failure is as a result of Acts of God (including fire, flood, earthquake, storm, hurricane or other natural disaster), war, invasion, act of foreign enemies, hostilities (regardless of whether war is declared), civil war, rebellion, revolution, insurrection, military or usurped power or confiscation, terrorist activities, nationalization, government sanction, blockage, embargo, labor dispute, strike, lockout, robbery, theft of data or any interruption or any failure of electricity or server, system, computer, internet or telephone service.